FIRE AND ICE . . . that's what you get when you take the cool looks of the Volkswagon Beetle, Bus, Karmann Ghia, Thing, Squareback or Fastback and unleash the hot performance of the air-cooled VW engine. How to Hot Rod Volkswagen Engines gives the real skinny for breathing-on, blueprinting and bulletproofing your air-cooled Vee-dub. Street, custom, kit car, off road, or full-race, this book gives you all the air-cooled engine-building basics to find and put to the pavement hidden horsepower. Includes tips on carburetion, ignition and exhaust tuning, case beefing, cylinder-head flow work, camshaft selection, lubrication and cooling upgrades, 6-to-12-volt conversions and much more. Plus there's a natty 6-page history of the origins of the first air-cooled VW engines. All neat stuff, this. Go ahead. You deserve it! Double or triple the output of your air-cooled Volkswagon. Or add 10-15 horsepower with easy bolt-on mods. Mild or wild, do it the right way-with this book. More than 300 photos, drawings and charts to guide you through your VW's innards. And don't look back. Bill Fisher is the author of How to Hot Rod Volkswagen Engines among other automotive how-to books. 5.0 out of 5 starsThe Must Have Book, shows & tells so easy than new day book’s !! I have to tell You, if you have a older bug then you will want this old book under your drivers seat. I had this book back in the mid “70’s” and it was left under the drivers seat of a 1969, so You happen to fine it and have the Bug you found it in, l’ll be more than happy to give You double what l sold you the car for. $250.00 plus this great book. And if You did Not get this book, the time to get it is right now, before they are gone. This is One of the few out there that shows You every step to take and even to make a joke or few while your rebuilding your Bug. It is written like You & Your Buddy are working on the picnic table till your mother see’s the oil dripping off the table. 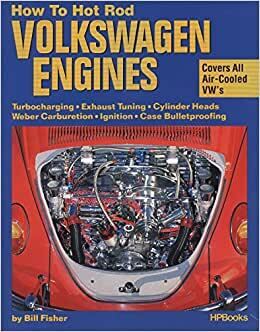 Every step in this book of how to with your air cool VW motor. Nothing about how to clean off the oil on your picnic table so make sure You have it covered with a 4x8 sheet of plywood it will soak up the oil and not the table. Ive built 4 buggies and a Baja bug. I bought this book to see what was new in VW motors. This book was copy righted in 1970 and has a lot of useful info on VW motors, but is way out of date. Welded counterweighted crankshafts and roller cranks went out with DISCO ! Im going to read through this trip to the 70s. 4.0 out of 5 starsGood Building Reference. Don't Overlook It! I bought this book to guide me on basic building techniques. This book is dated. My version was "used", literally from 1970. This guide refers to 1600 dual ports, 92mm cylinders, and IRS as "new technology", so it won't be a lot of help on big bore builds. However, where this book excels is on building techniques: case upgrades, counterweighting crankshafts, prepping crankshafts, building pushrods, bore machining, head assembly. The book can save you time and money simply by avoiding poor building techniques and little details that we tend to overlook. It's a cheap book, spend a few bucks and avoid some headaches. If you avoid one mistake the book will pay for iteself. 3.0 out of 5 starsGood guide, but very outdated product recomendations. Has a lot of good theory of how and why updgrades work and how to apply them, but very,very outdated. Dont expect to be led to good products for performance upgrading. The carburators recomended were carbs that went out of manufacture 25-30 years ago. Carter Duece and Holley Bugspray. No mention at all of the venerable Kardons used widely for dual carb upgrades for the last 40 years. Same for exhaust manufacturers. Also very little info on Dual port motor upgrading as I guess they were 'new' at time of printing. Pony up and buy the 'Aircooled VW Engine Interchange Manual' for up-to-date info.